I am not one for baking cookies and cakes. So if I can get these Shortbread Cookie Sandwiches into the oven in 10 minutes, you can probably do it in 8 minutes! No mixer and just 3 ingredients. 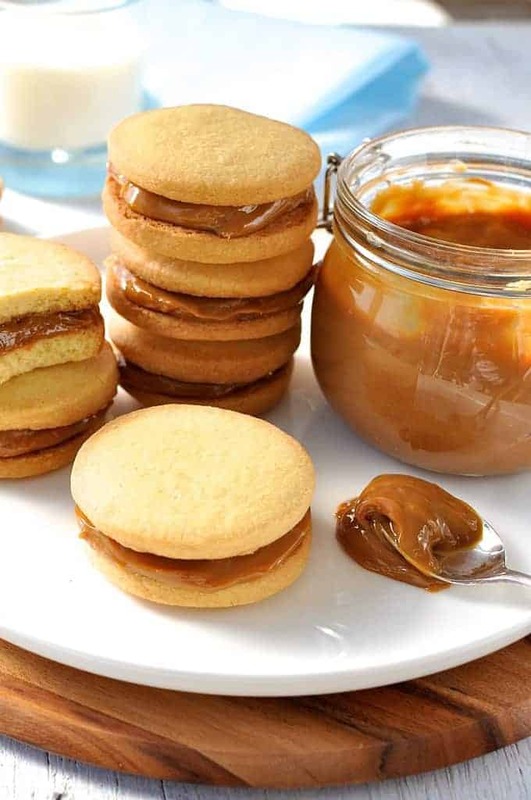 These insanely addictive morsels are based on a South American treat called Alfajores which are shortbread cookies spread with Dulce De Leche (caramel) and sandwiched together. The shortbread used in Alfajores is not difficult but …..well, honestly? When I started to prepare to make the biscuits, I simply couldn’t muster the energy to do the full blown “real deal” shortbread for the Alfajores which required pulling out my Kitchen Aid, 20 minutes prep rather than 10 minutes, and 6 more ingredients. It had been a long day! I made these biscuits at 9.30pm at night so I could photograph them in the morning! So after about 3 seconds of indecisiveness, I decided to make my “go to” shortbread instead. And truly, these are so delicious that I am not entirely convinced I will ever make Alfajores again….. This is the recipe I have used for shortbread since I can remember. Probably since I left home at the tender age of 18 and had to fend for myself (I’m not going to tell you how long ago that was!). It does not require a mixer and it literally takes 3 minutes to mix up. The dough is soft and easy to handle, not so sticky that it’s difficult to roll out and to place the cut rounds onto the baking tray. And the thing that always gets me is how smooth the silky the surface is when it comes out of the oven! They definitely look like they took more than 10 minutes of work. Now that’s my kind of baking! These cookie sandwiches are filled with Dulce De Leche made in a slow cooker which requires only 1 ingredient and takes 15 seconds to prepare. All you do is place sealed cans (without even removing the label) into a slow cooker, cover with water and then set and forget. When you open the can, you will be greeted with insanely rich, thick caramel which is perfectly smooth (no stirring required!). It’s a miracle. These shortbread cookies only require 3 ingredients and 10 minutes to prepare to pop into the oven! 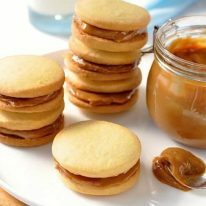 These are sandwiched with Dulce De Leche caramel filling which requires only 1 ingredient and takes 15 seconds to prepare. I made these cookies quite large so each one is a rather generous sized serving. You can make them smaller if you want, just adjust the baking time. Line a baking tray with parchment paper. If your baking tray is small, you might need 2. Combine butter and icing sugar in a bowl and mix until smooth and well combined. Add flour and mix until it starts to look like dough (it will start out looking crumbly but it will come together). Use your hands to roughly form a ball. Scatter icing sugar over a work surface and turn the dough out onto it. Flatten out to about 1cm / 1/2” thickness with your hand, then place a sheet of baking paper over it and use a rolling pin to lightly roll it out to 0.5cm / 1/4 “ thickness. Use a 6.5cm/2.5” round cookie cutter to cut rounds out, then use a knife or egg flip to transfer the cookies to the baking tray. Ball up the excess dough and cut more rounds. You should get 16 cookies. Bake for 15 to 18 minutes until pale golden brown and starting to just slightly brown on the edges. You might think it is undercooked, but it will continue to cook on the baking tray. 1. The dough is quite soft so you will need a large knife or egg flip to transfer the rounds from the work surface to the baking tray. If you pick it up, they will lose their shape slightly. 2. The other option is to roll the dough out onto baking paper the size of the baking tray. Cut out rounds, making sure to space them like you would place them on the baking tray. Then remove the excess dough. Then roll the dough up, roll out and repeat. Then lift the baking paper with the rounds on it onto the baking tray. Though slightly easier because you don’t have to transfer the cut rounds onto the baking tray, it takes longer overall. How long do these last? Also, are they crispy or puffy? I am thinking of making these tonight! They are great for a few days – up to 4 if you keep them in a really good airtight container! Are these cookies puffy or crispy? I am going to try to make these tonight! Hi Zach! Nope they are like shortbread. So soft and crumbly and buttery! These look so fancy! 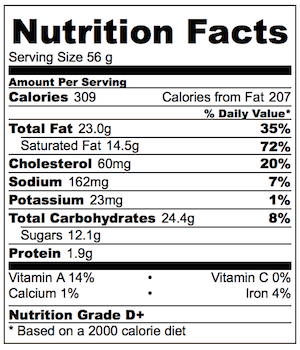 Can’t believe there’s only 3 ingredients! What took longest was thawing out the sweet butter from the freezer.. She said, ” 3 ingredients?, no way”. I said,”way”, and whipped them out in 10 minutes, plus baking time.. Oooh!!! I’m so glad you enjoyed these Ross!! I’m seriously impressed – you got them in the oven in 10 minutes?? You’re a legend!! PS I love hearing tidbits of your conversation with your wife!!! Makes me grin every time. PPS You got the good end of the deal, didn’t you?? The clean up is my least favourite part, but I can’t ever leave a sink full of dirty dishes! Sometimes I clean up 5 times a day, with the amount of cooking I do!!! Made them again today, Nagi! This time I rolled dough a bit thicker and watched the baking time more carefully. Pics to come on Instagram after I fill them. Yum! Another winner of a recipe, Magi! I made these to take for refreshments after a Friday evening Sabbath service at my synagogue. Oh, my, they disappeared so quickly, and everyone raved about them. I used a variety of fillings–homemade salted caramel sauce I had on hand, raspberry jam, raspberry chocolate buttercream. Everyone wanted caramel, and I didn’t have enough of those to please them. It certainly took me longer than 10 minutes to prep them. I made them smaller, 1.5″ to be bite-sized, so the rolling/cutting/transferring took way more time. I also added a bit more flour to make the dough easier to work with and move. My second cookie sheet looked better, as I got them out of the oven a bit sooner. Even at the smaller size, they took about 15 minutes (in a convection oven at 325F). At that size, I got 58 single cookies out of the recipe. I may have rolled them a bit thinner than yours; next time I will work on making them thicker and more even. That said, the results looked good and tasted even better. Someone thought I had bought mini-Milano cookies from Pepperidge Farm. (Perish the thought!! I had three different types of homemade goodies). Once she tasted the first one, the rush was on. I had none left to bring home to my husband (though I had saved the not-so pretty ones to fill for him). I will definitely make these again and if they come out well, will take pics for you. What a compliment though, for someone to think you bought them! I would love to see photos! The easiest way to share them, I think, is on Instagram – my account is recipe_tin. 🙂 I love chatting to people on Instagram as much as I love seeing their photos of my recipes!! I tried this and don’t know what I did wrong but my mixture looked like butter icing and no dough :-(. I had to put blops of “icing” on a baking tray. It tastes great but was falling apart. Please help. Petro, I am SO sorry, there was a MASSIVE typo in the recipe, it should be 2 cups of flour, not 1 cup. I have updated the recipe. I am so sorry, I feel terrible! I wish there was somehow I could make it up to you! Don’t suppose you live in Australia? Because if you do, I’d make up a batch of these for you and express courier them to you!! I am so sorry again, I feel terrible! Quick, easy shortbread with caramel. What’s not to love ? They sure look so enticing … Would love to have a couple of this right now. It’s morning tea time here so I am actually nibbling on one as I write this response!! So does this mean I cannot just eat all the dulce de leche straight out of the can?!?! You mean you had a higher PURPOSE for that deliciousness??? 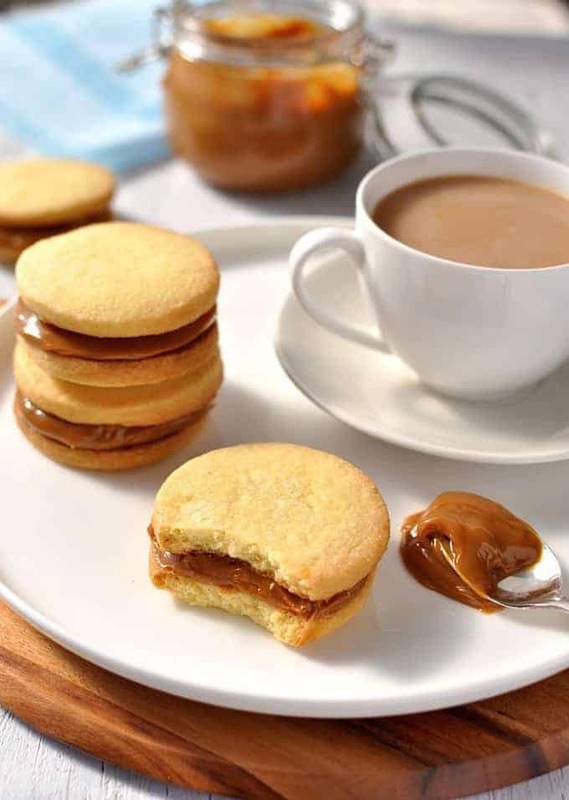 But truly, these shortbread cookies are pretty amazing, with or without the dulce de leche (because we both know I have none left to spread on cookies). YOU ARE MY HERO. Oh no. Did you miss the part where I made TWO cans of dulce de leche? One to eat straight out of the can…the other for this one!! Based on my description above, I’m obviously not a baker – so this 3 ingredient recipe is perfect! Paired with that wonderful dolce de leche – sounds heavenly! By the way, I’m still using that slow cooker dolce de leche – just had some on my waffles – yum! Oh, this is soooo my kind of baking, too. I’m not really a baker, either (are we actually long-lost twins?) but I do like eating sweet treats sometimes so it would be good to have some short-cuts like this up my sleeve. I’ve always thought alfajores sounded and looked amazing. Now you’ve given me a lot more incentive to try making them! Oh my goodness, what perfect little cookies these are. I love a simple shortbread cookie because they allow the filling to shine. This is so simple and luxurious at the same time, I love it! It reminds me of the funfetti cookies you posted recently! If I recall, that had condensed milk in it. Great shortcut! Oh yeah, they had condensed milk it them, the taste might be similar, but yours are even better with that condensed milk caramel!